This forest jewel with deep green and red leaves grows in the deep shade of the coastal forest growing the sandstone cliffs of the Pondoland river gorges. 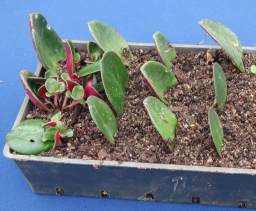 Although rare in nature, it propagates easily and would make an interesting indoor plant. At first this plant was thought to be a form of Crassula multicava, but in fact differs from it in several ways, the main one being that the guttation glands which form pits on the leaf surfaces only occur along the margins of the leaves in Crassula streyi and are not scattered on the surfaces. The broadly elliptic succulent leaves are dark glossy green on the top, while the under surface is maroon to carmine giving it a striking appearance. Some forms have attractive white spots along the veins on the upper surface of the leaf. The leaves become longer as they age. It is a relatively slow growing perennial to 350 mm tall, but is usually shorter as the stems tend to sprawl and lose the lower leaves as get older. The lax stems sometimes send down roots. The dainty terminal sprays of greenish yellow flowers are tinged red and borne in May and June. According to the Red List of South African Plants, Crassula streyi is Rare. It is known from fewer than five sites and is restricted to a specific habitat, but is not threatened because its habitat is inaccessible and it occurs within the Oribi Gorge and Mkambati Nature Reserves. Crassula streyi occurs from Oribi Gorge in Kwa Zulu Natal to Mkambati Reserve in Pondoland. Both these reserves are on or near the coast. It always grows in shade, usually on cliff faces in the subtropical forests of the area. It is found in the moist, humus-rich pockets of soil on the sandstone and occasionally in the leaf litter that collects on the forest floor. It was first collected by Mr. R.G. Strey of the National Botanical Research Institute in Durban and was named in his honour. The name Crassula is derived from the Latin crassus meaning 'thick' and refers to the leaves. The genus Crassula occurs mainly in southern Africa and is a large one with over 300 species. About 150 species are found here, with others found in Europe, America, Australia and further afield. A very similar plant is C. multicava, a popular garden plant much used as a ground cover. 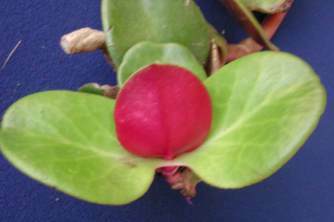 Because this plant is known only from a few localities, not much is known about it. It is thought that the bright red under side of the leaf enhances the collection of light in the deep shade of the forest floor. There are no records of this plant being used or grown. Because the plant can tolerate very low light conditions and has such attractive contrasting leaf colours, it would be very suitable for indoor pot plant culture. It could possibly also be used as a ground cover in shady positions or in a very shady pocket in a rockery, but it is not as fast growing or robust as Crassula multicava. It is drought resistant too. 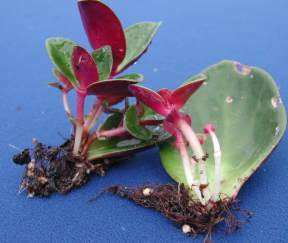 The plant is best propagated from stem or leaf cuttings in trays containing a mixture of equal parts fine milled bark and coarse perlite. The leaves or cuttings should be allowed to dry out for one or two days before inserting them in the mixture. Planted trays should be kept on the dry side in very shaded conditions until the new stems appear after which they can be potted on into bags or pots containing a loose well drained mixture and kept in deep shade. Hollman 1997 observed that rooting takes place best at the nodes in stem cuttings. 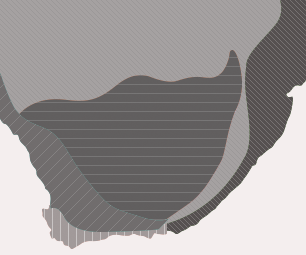 VAN WYK, A. E. & SMITH, G. 2001.Regions of Floristic Endemism in South Africa. South Africa; Umdaus Press. TÕLKEN, R. R. 1973; The flowering plants of Africa; Vol 42 parts 3 and 4; South Africa; Botanical Research Institute. SCOTT-SHAW, R. 1999. Rare and Threatened Plants of KwaZulu-Natal and Neighbouring Regions; Pietermaritzburg. KwaZulu-Natal Conservation Service.